I threw up some recent logos on flickr there. Cedarwood is a furniture chain in Waterford, Mission Control and PropelX are Propylon products, Mianach is a venture capital company, (check out their beautiful site too!) Chocolottery.net was a TodayFM promotional mini-site, Working Pictures print and install advertising in airports and train stations, Rua is Liam’s software consulting company, Millhouse is a nursing home in Wexford, they have uniforms with the logo on, and sunseekers is a Spanish property company. I have a few more recent ones that I should put up some time soon. I love doing logos, they have to be clean, to-the-point, clever/humerous/smart and when they’re done, they’re done, you can’t change them around. They are fun to work on, trying to get lots of info into a small graphic. Sometimes people give me jobs to do, expensive jobs like a website or something, and they’ve gone and done their own logo in Word or Paint or some crap, and then everything I do has to be emblazoned with this ugly logo. You really get no enjoyment out of those kinda jobs. Whats the point of wasting your time as a businessperson trying to come up with a good logo to save the price of getting a designer to do it. Especially if you’re going to have to hire one later to do your stationery and website and all. Logos are often misunderstood because they are so simple looking. But that simplicity hides the hard work that went into it. Clients want it to say this and to evoke that. Trying to get the company image and values into a typeface and graphic is pretty tough mental work. And then there’s the technical issues. A logo has to be printable in small sizes, in pure black and white, has to look good going through fax machines (remember those? – think my dad still uses one!). 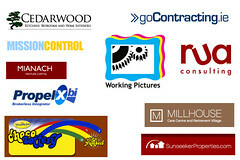 For all their challenges, logos are very satisfying to work on, they are reproduced everywhere and become recognisable. Its great to see a logo you designed displayed in public.